Some patients react to stress by grinding their teeth unconsciously during the day or, more commonly, while sleeping. The constant pressure and motion can harm teeth, as well as muscles and tissues in and around the jaw. Damage to these oral structures from this condition, known as bruxism, can be remedied with a nightguard. Common symptoms of bruxism include a sore jaw, headaches, or earaches. Causes vary, but they may include stress, anxiety, tension, misaligned teeth, posture, diet, sleeping habits, and other factors. Bruxism is most prevalent in women and generally found in about one-third of the population. How can you stop an unconscious habit? A thorough evaluation will allow us to check your teeth, tissues, and muscles. 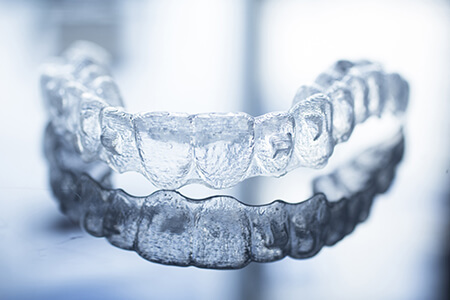 If we determine that you suffer from bruxism, we'll create an orthodontic appliance, also called a nightguard or splint, to prevent grinding and clenching. Many types of nightguards exist, and patients react differently to the various styles. If one appliance does not work, another may. In many cases, simply wearing a nightguard will eliminate the problem. However, if the condition persists, we can prescribe alternative therapies to help manage the issue. Some practices that can relieve symptoms of bruxism include stress and anxiety management, focused facial relaxation, massage and stretching of face and neck muscles, applying ice or wet heat, proper rest, eating soft foods, and hydrating the body. If your teeth were damaged because of bruxism or if we find TMJ to be a factor, our team will repair your teeth and treat you to provide complete relief.